Deep pits or deep water where the general use of sheet pile cofferdam, sand, clay, gravel soil flow and drunk stones are also suitable. Because it is in addition to waterproof performance, there is a strong overall stiffness. In addition, it can be used as part of the infrastructure, because of its re-use, you will be able to save a lot of wood. 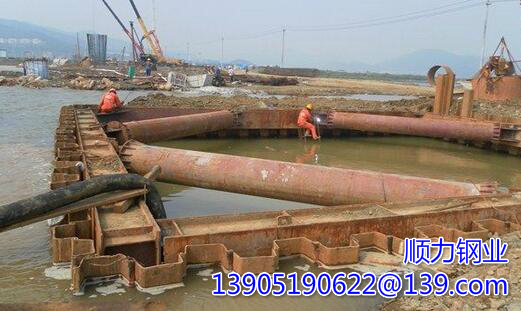 Steel sheet pile cofferdam flow ≤ 2.0m / s, the thin coating layer of a bedrock, the depth is not buried in the water based on the general conditions, which is it can be used in the pile structure. Double-walled cofferdams are generally applicable to conditions based on large deep-sea rivers, overburden beds, if thin flat-bed rock beds. The steel sheet pile coffer is inserted from the first corner pile in a clockwise order (or counterclockwise), from which the former can not be inserted. From the vertical direction the two simultaneously control each other to ensure the vertical fairness of the first course, especially when, in order to control the vertical wells to strictly overlap, perforated steel sheet piles. To be connected, the guide box is inserted into one or more stabilized posts after the play. When pulling a pile of steel sheet piles, such as using a hydraulic crawler set to pull such a machine, you can rent a useful tool. Z-beam sheet pile sales pull machine pick up the gray line hanging in the air, (10 meters or less) to pull the pile near the machine, two auxiliary helper, good mechanical direction to be discharged to the mountains.